Update January 2016: The webinar has now been withdrawn from the Physics World web site. Please contact us if you are interested in this topic. 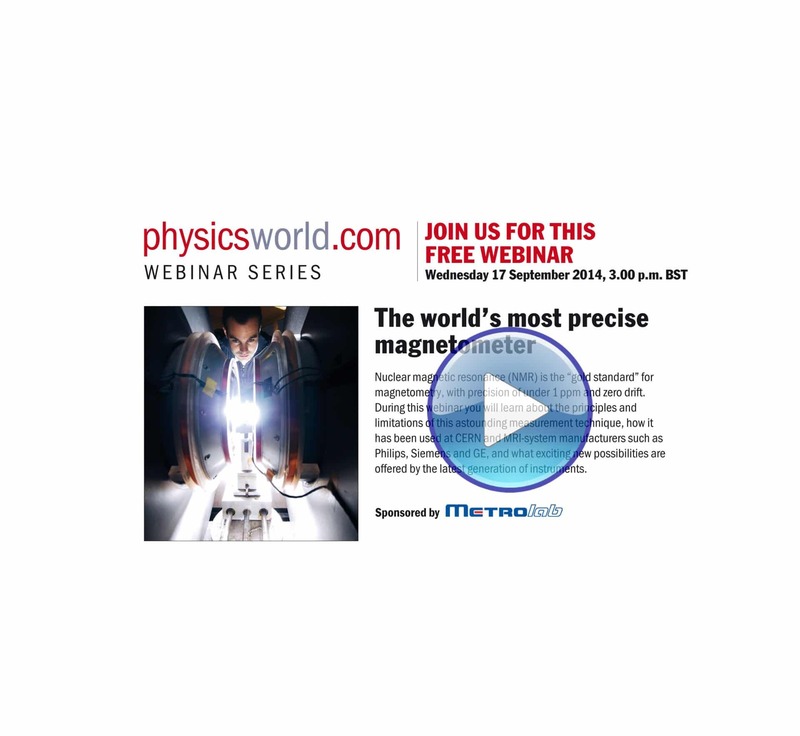 On September 17, 2014, Metrolab gave a webinar on NMRNuclear Magnetic Resonance. A resonance phenomenon seen when you irradiate a sample in a magnetic field with an RF field.... magnetometers, including the introduction of the all-new PT2026. - the latest member of this instrument family, a flexible and modern laboratory instrument that pushes back the key limitations of NMRNuclear Magnetic Resonance. A resonance phenomenon seen when you irradiate a sample in a magnetic field with an RF field.... magnetometers by nearly an order of magnitudeThe magnetic field is a vector quantity. We may be interested in its individual components or its total magnitude....: rangeThe range of a probe is defined by the minimum and maximum field strength it can measure. On an instrument,..., resolutionResolution measures the ability of a magnetometer to distinguish ("resolve") two nearly identical field values. Related to precision, but not to..., speed, field inhomogeneity and probeThe actual sensor that is placed in the magnetic field. The NMR probe contains the NMR sample; the Hall probe... size.